Let's go make some fantastic Croutons! Cube bread: Cut slabs to the thickness you want your croutons - we generally like about 3/4" (2 cm). Remove crusts, then dice. Set aside for later use. Let cubed bread sit in oil, stirring occasionally to ancourage all sides of the bread to absorb the flavours/oil. Bake for approximately 20 - turning the crouton once or twice so the bakes on all sides. They are done when they feel a little crisp on all sides. Move croutons to a paper towel to remove excess oil. Fry cubed pieces of bread, over medium/medium-low heat, turning them regularly until they are slightly crisped on all sides. Move to paper towel to remove excess oil. For dishes such as Caesar Salad, create a savoury crouton. This adds to the over-all salad flavour. We soak the bread in oil in our pan, then use paper towel to remove the excess oil (we're lazy and don't want the bowl, from oiling the bread, to wash). On the other hand, oiling (or buttering) the bread in a separate vessel (from the pan) leaves less oil in the final product. We use cast iron - it's perfect on the stove top or in the oven ... and SO easy to clean up using, simply, a scouring pad and very hot water. You may, of course, choose your prefered cooking vessel. Avoid over-oiling the bread cubes. Lightly butter a couple of slices of bread - both sides, dice them and bake them. Use a flavoured (eg, salted, garlic or otherwise herbed) butter, to flavour the croutons. Croutons store well in an air-tight container. A refrigerator will cause further drying of the crouton. Crouton is a French word (Croûton) for "a small piece of toast". It is derived from the French word, Croûte, or "crust". 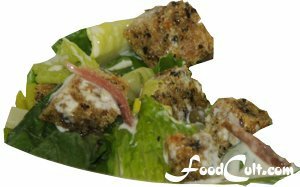 Croutons are used, widely, in a range of dishes from Caesar Salads to French Onion Soup (as well as other dishes). Croutons may be prepared in any number of ways. They may be plain or seasoned. They may be fried or baked. Some people may, simply, toast a piece of bread (for what we believe would be the most pointless, boring crouton ever). While the Calabrese Bread is just about our favourite for croutons, a whole grain bread is a healthier and still absolutely delicious choice. What we are illustrating here is croutons made from cracked wheat bread (though lighter than the recipe - using only a little less than one cup of whole wheat flour). While a little outside convention, it is a wonderful high-fiber crouton option. The Italian White Bread is also nice - acting as a canvas for any flavours you would like to incorporate into your crouton. We do not recommend using egg breads for croutons.